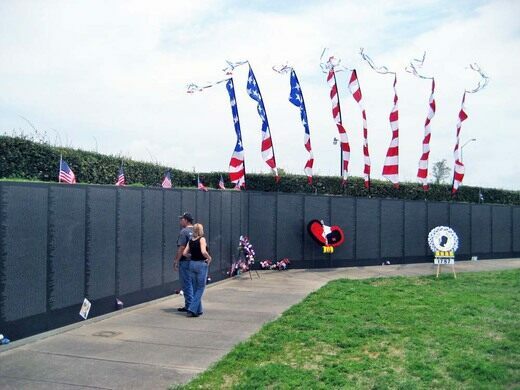 Florida’s half-sized replica of the Vietnam Veterans Wall. A local landmark with generations of spraypainted messages, and more being added each day. One of the best places in Florida to spot rare, carnivorous pitcher plants. 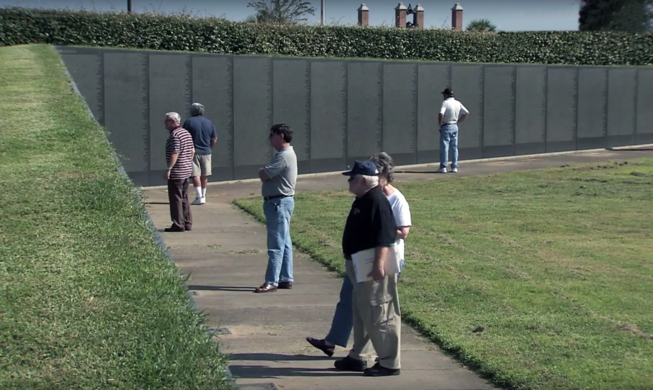 The idea for “Wall South” was born in 1987 when the “Moving Wall” temporary memorial installation passed through town and drew an emotional impact on the local community. 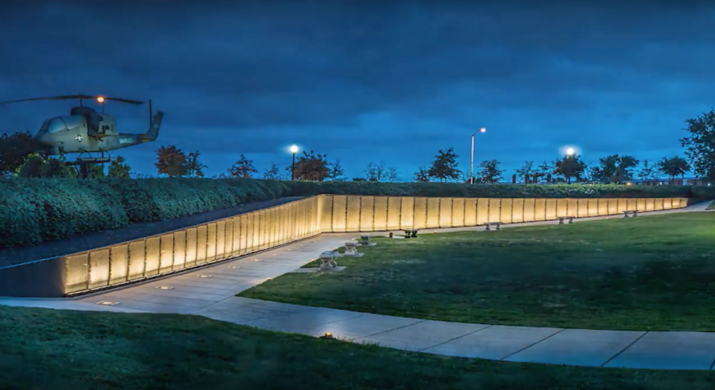 Marine Corps veteran Bill Davis was a member of the planning party and later described the project as a straightforward but genuine nod of respect to the full-scale wall designed by Maya Lin. After years of private fundraising, the Pensacola City Council set aside 5.5 acres of a public baseball field and dedicated Wall South in December 1992. A crowd of thousands gathered to view the unveiling and listen to a reading of all 58,000 dead and missing. The Wall South is a good copy—if in half scale—of the Lin original, with 58,315 names in Optima typeface, arrayed chronologically by date of death. But despite initial efforts to source stone “ from the same quarry, using the designer’s original plans and involving the original engraver and others connected with the Washington project,” Wall South ended up using a lighter Pennsylvania granite instead of the original Indian imported slabs. 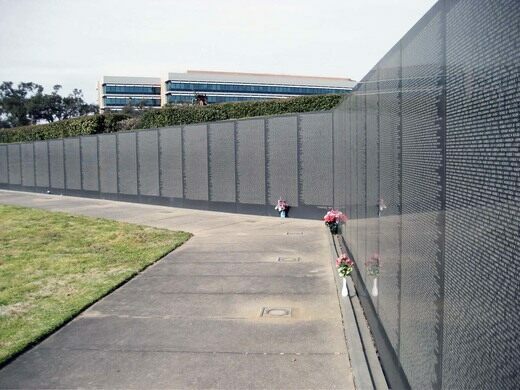 Construction of Wall South was so controversial at the time, the D.C. Vietnam Veterans Memorial Fund threatened to sue their Floridan brethren over copyright infringement. The Pensacola City Council consulted its lawyers and plunged courageously forward with construction, forcing the D.C. memorial to essentially admit that the claim of intellectual property was a bluff. Today tempers have cooled between the memorials, and the Sunshine State’s veteran community proved that there’s plenty of wall to go around. 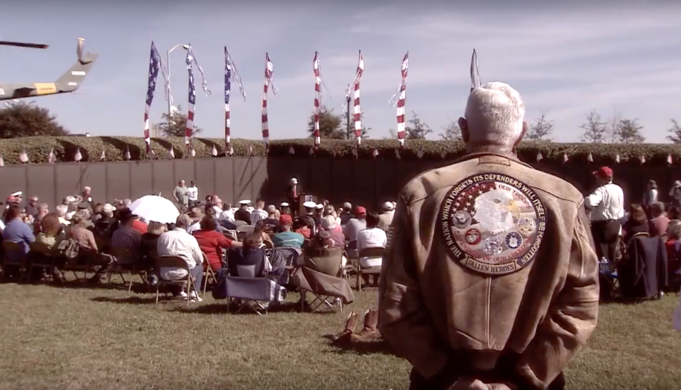 Wall South is located in Veterans Memorial Park Pensacola, a monument-dense collection of shrines to the American revolution, Korean War, WWI, WWII, and War on Terror. A former hospital is now home to a pizza parlor and maybe a few ghosts. This now-deactivated naval base defended the Florida coast for centuries. Pensacola's UFO home has withstood many hurricanes—just as the experimental 1960s design intended. The sculptor was instructed to add “stallion attributes” to the general's bronze mare. An unusual ode to the late Irish playwright, complete with a squiggly bust and coffin-shaped bench. This massive monument towers over the city as a constant reminder of the lives lost during Algeria's hard-won war for independence. This super-sized statue is the only public memorial to the deal that ended America's neutrality during World War II.